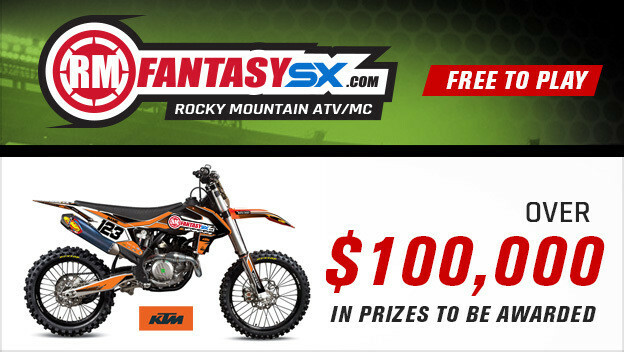 PAYSON, UT (December 26, 2018) – RMFantasySX, the fantasy supercross game by Rocky Mountain ATV/MC, returns for the 2019 Monster Energy Supercross season for the 6th straight year. 10 grand prizes will be awarded to the top finishers, including KTM 450 SX-F and 250 SX-F race-prepped dirt bikes for 1st and 2nd place. The combined prize total with weekly prizes included will add up to more than $100,000. The growth of RMFantasySX has continued to improve each year. 2018 saw a 12.6% increase on the previous year, with 77,635 players signing up to play the game. A few simple changes for 2019 make this easy-to-play game an even better experience; namely, the option to set reminders to submit your picks each week, and the opportunity to join up to five groups for the group play feature. The rules remain unchanged – players select picks for their predictions of the top five spots plus a wildcard each round for a chance to win big. Points are awarded as follows: 1st place = 26 points; 2nd place = 23 points; 3rd place = 21 points; 4th place = 19 points; 5th place = 18 points; wildcard = 26 points. Subsequently, the overall available points scored per round equals 133 points. If you select a rider for the top five who finishes in a different position than you predicted, but still places within the top five, 5 points will be awarded for that rider. RMFantasySX will continue to award prizes to the top 10 winners each week which include great prizes from brands like 100%, Acerbis, Bell, Fox, Pro Honda, Rekluse, Scott, Seven, TLD, Tusk and more. The top 11-100 weekly winners will continue to receive a $10 gift card from Rocky Mountain ATV/MC as well in 2019. Allowing up to 100 players to claim a prize each week significantly boosts the prize count to over 1,700 throughout the season and greatly increases the chance of each RMFantasySX player to become a winner. "RMFantasySX has become something that we look forward to all year long," says Dan Thomas, CEO and Founder of Rocky Mountain ATV/MC. "It is such an integral part of the supercross season for us and we’re excited to continue to be able to offer a game where fans can interact with the sport they love and have a chance at winning some awesome prizes. Good luck to all of the players this year, here’s to another great season!" RMFantasySX is always free to sign up and free to play. Registration to play during the 2019 supercross season is open at www.RMFantasySX.com. Picks open on Sunday, December 30, for players to begin making their predictions for the opening race in Anaheim on January 5.